4 Bedroom Detached House For Sale in Bourton On Water for £509,950. 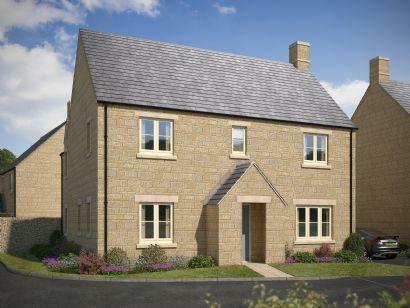 Honeystones is an exciting new development of 50 three, four and five bedroom homes located in Bourton-on-the-Water. This Cotswolds village is 4 miles from Stow-on-the-Wold and straddles the tranquil River Windrush with its series of beautiful bridges. It is regularly voted as one of the prettiest villages in England and residents proudly proclaim it as the 'Venice of the Cotswolds'. There is plenty to see and do with a wealth of leisure attractions, shops, restaurants and tea rooms. For families there is a range of excellent private and local schools, including the Ofsted Grade 1 Cotswold School, whilst for commuters there is good access to the A40 and M40 via the nearby A429. Honeystones is a rare opportunity to own a brand new build home just a mile from the centre of this exceptional location. The Evenlode is a superb 4 bedroom detached home with garage, triple aspect living room, large kitchen/dining room, dual aspect study, ground floor WC and en-suite to bedroom 1. The photos are representative of the show home from this developer and do not represent the interior of this particular home.